A millennial writer talks about the coming crises his generation will face. Millennials—defined by the author as those born between 1980 and 2000—have been sold on the idea that if they work hard in school, forfeiting play and creative time for work and sports, and go on to a four-year college, where they continue to work hard, then a solid, well-paying job awaits them once they graduate. But as Harris (b. 1988), an editor at New Inquiry, points out, many in that age group have discovered there is no pot of gold at the end of that particular rainbow. In today’s competitive economy, he writes, “young households trail further behind in wealth than ever before, and while a small number of hotshot finance pros and app developers rake in big bucks…wages have stagnated and unemployment increased for the rest.” Those who manage to attend college are often burdened by high student-loan debts, forcing them to work any job they can to pay the bills. Athletes who attend college on a sports scholarship pay with the physical wear and tear on their bodies and the stress of high-stakes games alongside a full academic schedule. Harris also evaluates how millennials interact with social media (a topic that could warrant an entire book on its own), which creates a never-ending link to nearly everything every day, never giving anyone a chance to unwind. Professional musicians, actors, and other performing artists face strong competition in a world where anyone can upload a video to YouTube, so those with genuine talent have to work that much harder for recognition. After his intense analysis of this consumer-based downward spiral, the author provides several possible remedies that might ease the situation—but only if millennials step forward now and begin the process of change. 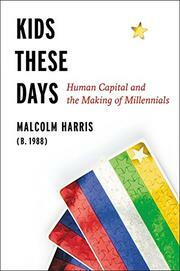 Harris still has plenty to learn, but he provides an informative study of why the millennial generation faces more struggles than expected, despite the hard work they’ve invested in moving ahead.